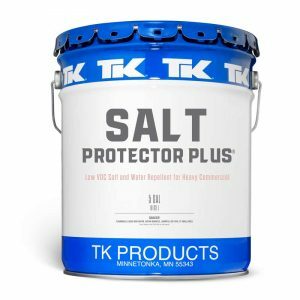 TK Products Salt Protector Plus Coating for Concrete. Salt Protector Plus is a water-based, low VOC coating that protects concrete and masonry surfaces from damage often associated with the use of salts or other de-icing agents. Vertical and horizontal surfaces can be protected with this coating and will not make the surface slippery, help to avoid costly or unrepairable damages.